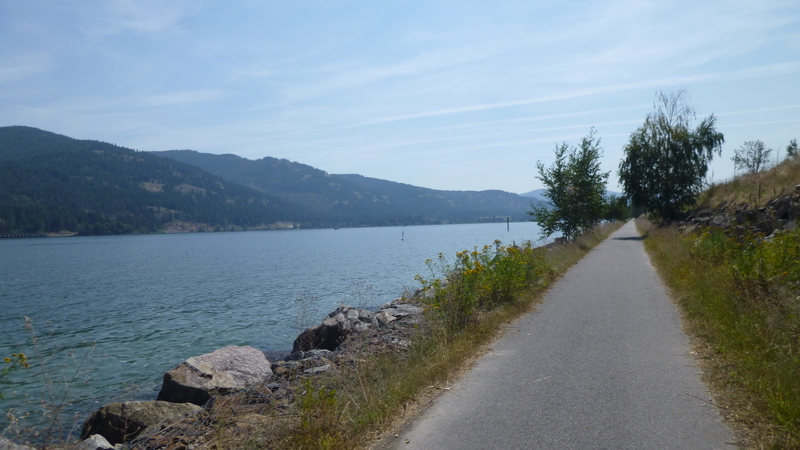 After I packed up our campsite, Tula and I headed back to Sandpoint. There was still some walking I wanted to do there, plus I had already called the Bonner Community Food Center to see what they might need. The guy I talked to said cereal disappears off the shelves almost as fast as it comes in, so he suggested maybe getting some cereal and milk. I found a grocery store and filled up the cart with a variety of cereal, and quart and half-gallon containers of milk. While I was shopping, I ran across another donation opportunity. 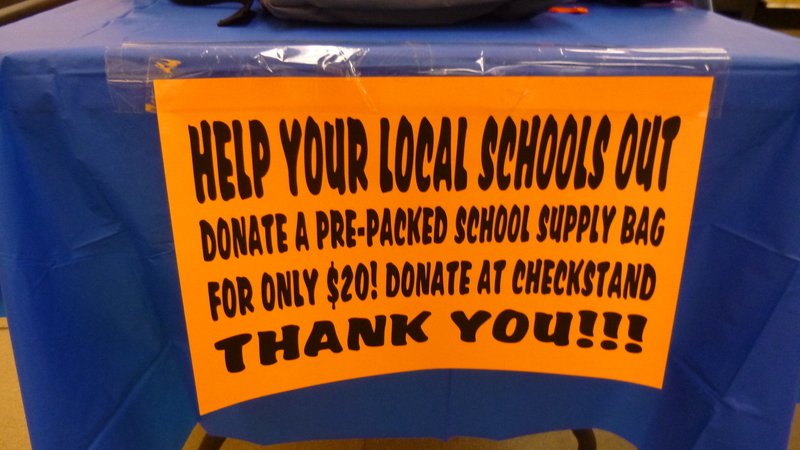 The grocery store had a table full of new backpacks that were loaded with school supplies, and people could buy them for $20 each, and donate them to the store, which in turn would pass them along to one of the organizations that help make sure students have everything they need. I couldn’t resist! I always liked getting school supplies, and I even peeked in the bags to see what all was in them, and they were well stocked. 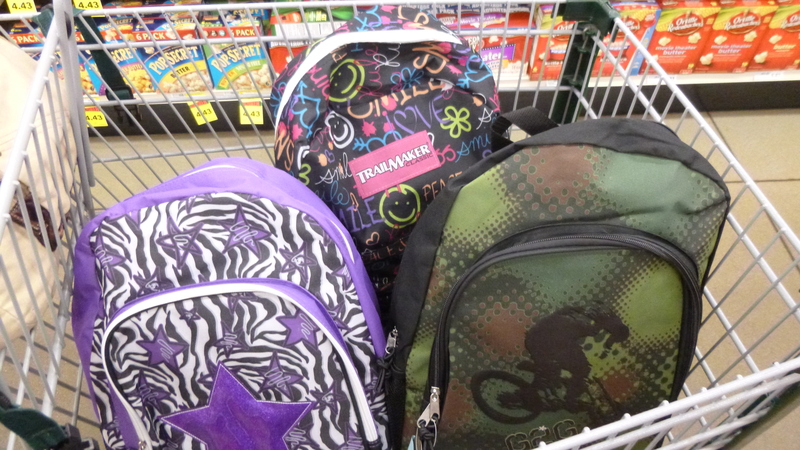 So after I got the cereal and milk, I went back for 3 backpacks, and they were set aside with some others to eventually go to a student who needs it. 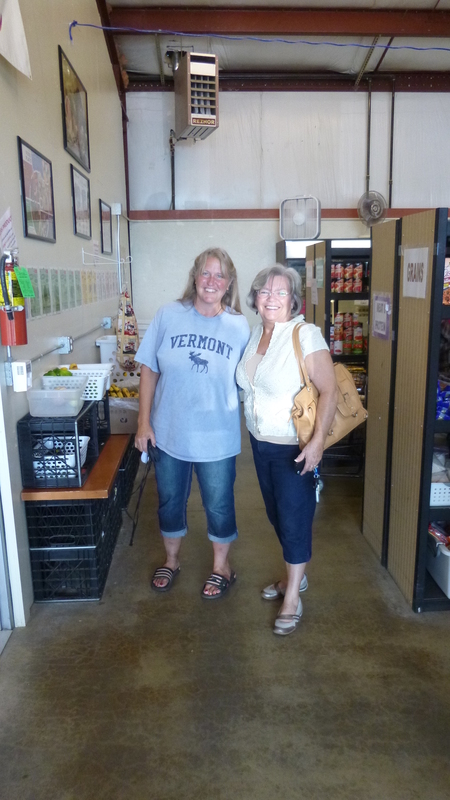 Then I drove to the food pantry, which was outside of town a bit, and carried the bags in. I met a couple people and they showed me around a bit. 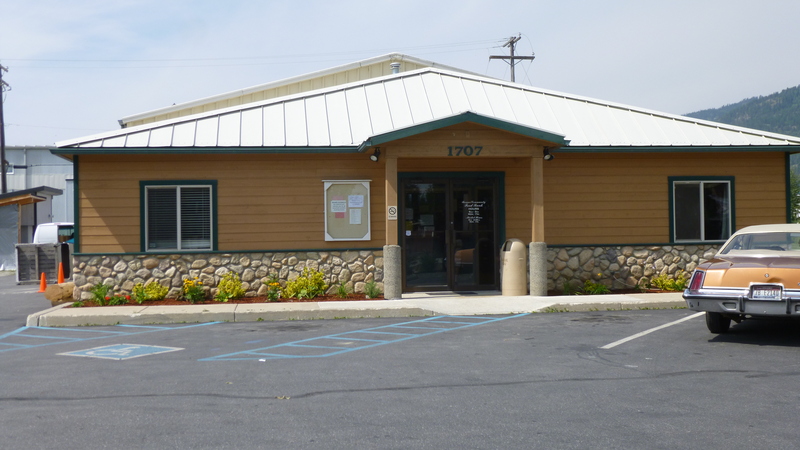 This food pantry is run a little differently than most of the ones I’ve visited, and it was interesting to hear how they do things. They use a point system based on the size and need of the family, and that family can come in up to 5 times a month to “shop” for the foods that their family likes. All of the food is marked with how many points it’s worth (for example, they already started marking the cereal I had brought in, and a large box of cereal was 5 points) and the families select their food, and then go through a check-out system, where the points are deducted from their account, and the balance is saved for the next visit. By this time, I was talking with Alice, the director, and I asked if that system made the bookkeeping more difficult, and she said it didn’t. Records of food coming in and going out have to be kept anyway, so it’s just a different way of keeping track of things. And the benefit is that the families don’t get pre-packed food that they maybe don’t like. Sometimes there is also some free food that the guests can take without using points – today there was a large bin of sweet corn that people could help themselves to. Alice also showed me the shelving units that are already being stocked for Thanksgiving baskets. She anticipates packing food for about 1000 Thanksgiving meals, and they’re already gathering the canned goods that will be a part of that – and 1000 cans of each item takes up a lot of space! Last year they helped thousands of people, and they passed out 1.6 million pounds of food. Wal-Mart is a huge donor for them, and I think she said they donated about $100,000 worth of goods. 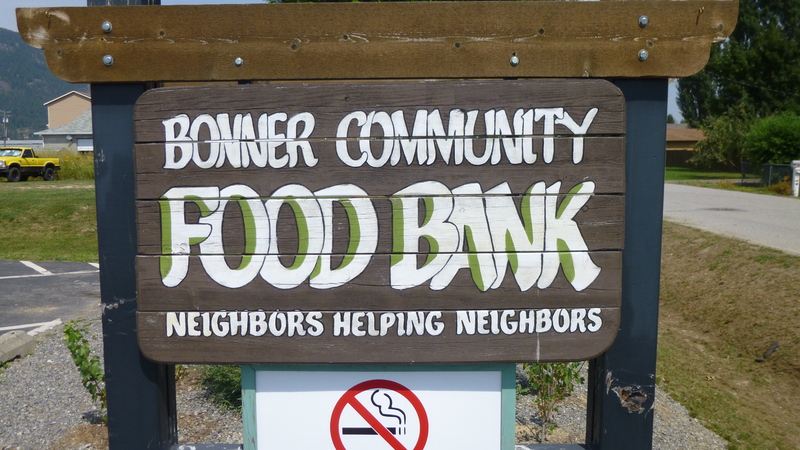 I find it really interesting to see and hear how different food pantries are run, and this one did things a little differently, and I liked it! After I was done at the food pantry, we drove back into town, and I got Tula out for a walk. 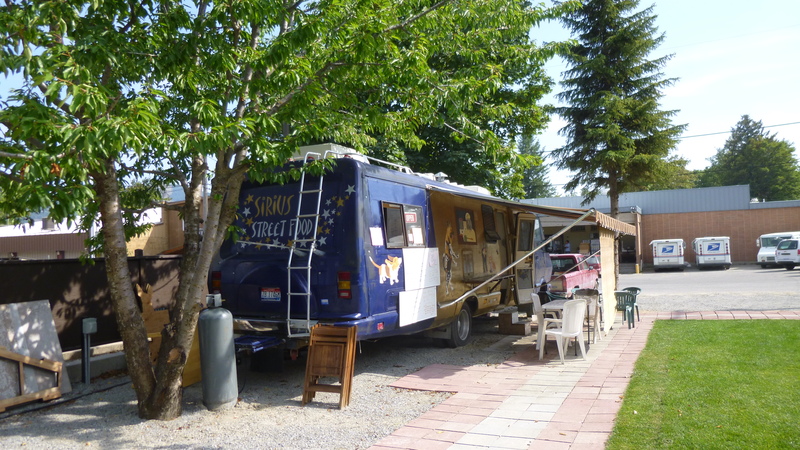 We passed some mobile food trailers and they were already getting ready for a lunch rush. 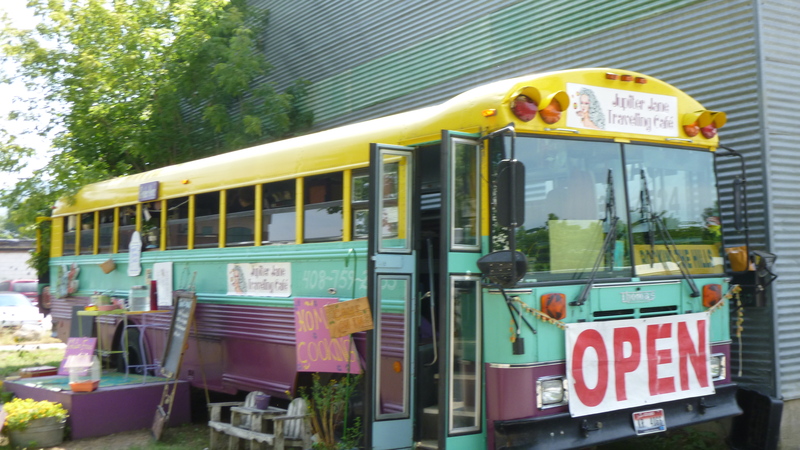 One of them was an old bus that had been colorfully painted and was called Jupiter Jane’s – they sold a variety of healthy food. 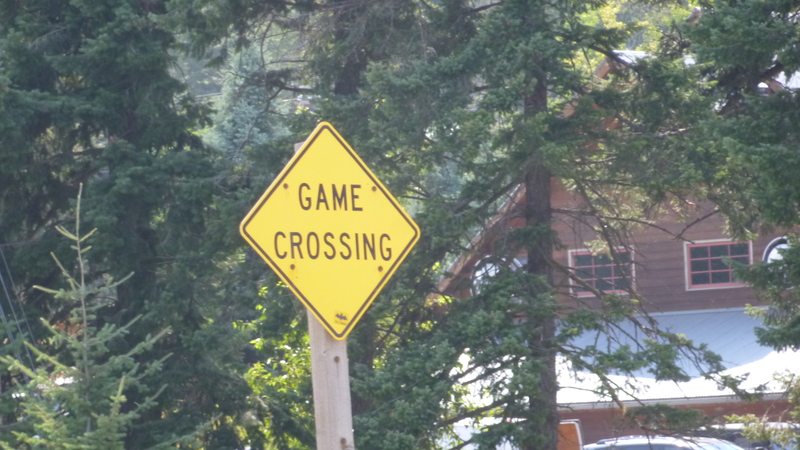 We walked around town again, and then I wanted to find the access point to walk across a long pedestrian bridge across part of the big lake. 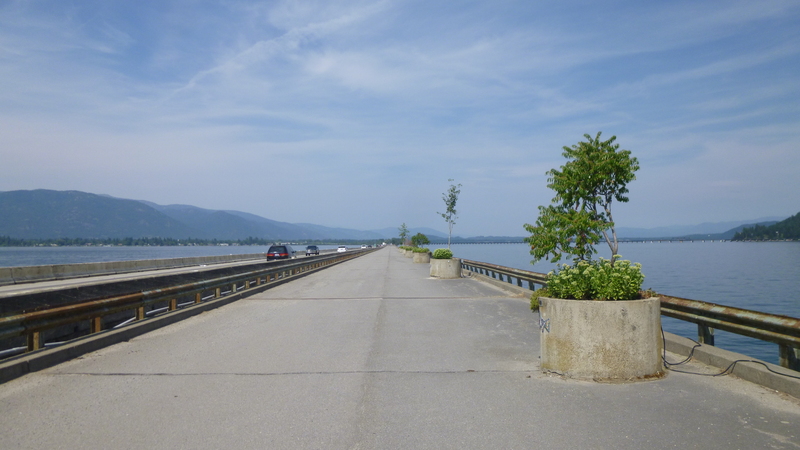 I knew it was going to be a long walk with no shade at all, so I left Tula in the car, and set off for a 5 mile walk across the bridge and back – it was a long bridge! The pedestrian bridge used to be for cars, and when they built a new bridge, they turned the old one into a pedestrian/bike bridge. 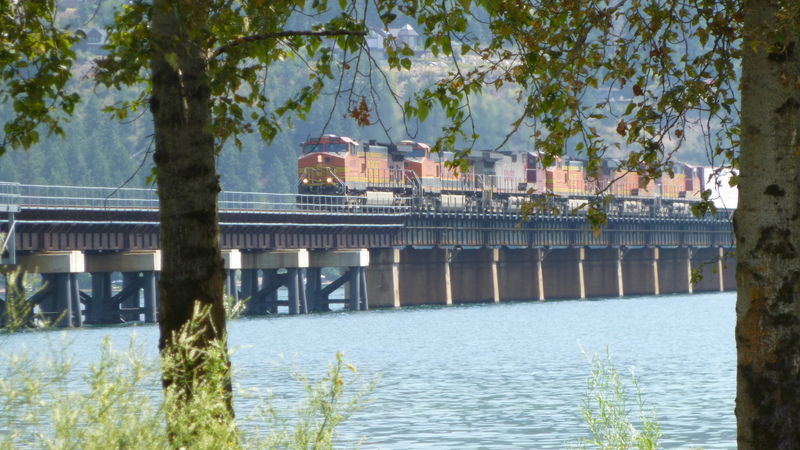 There’s also a long train bridge across this part of the lake too. 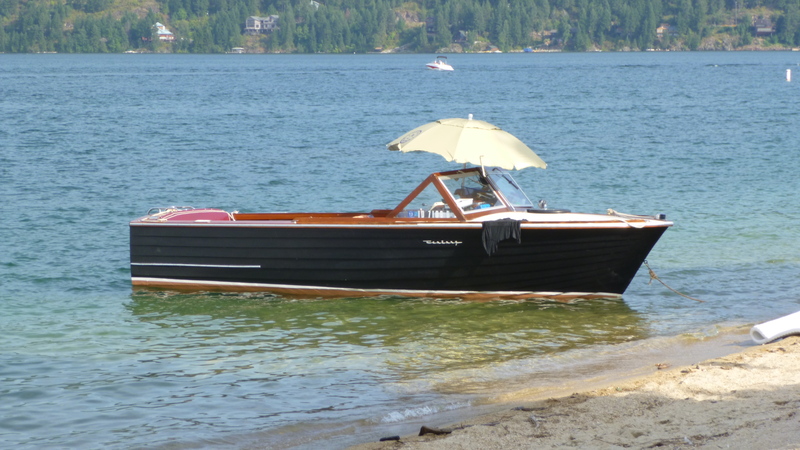 It was a pleasant day out for a long walk, and I enjoyed watching a couple trains and some people out in their boats. Then I was ready for some BBQ at one of the lunch trailers, but it was very late and they were out of pulled pork, which is my favorite. 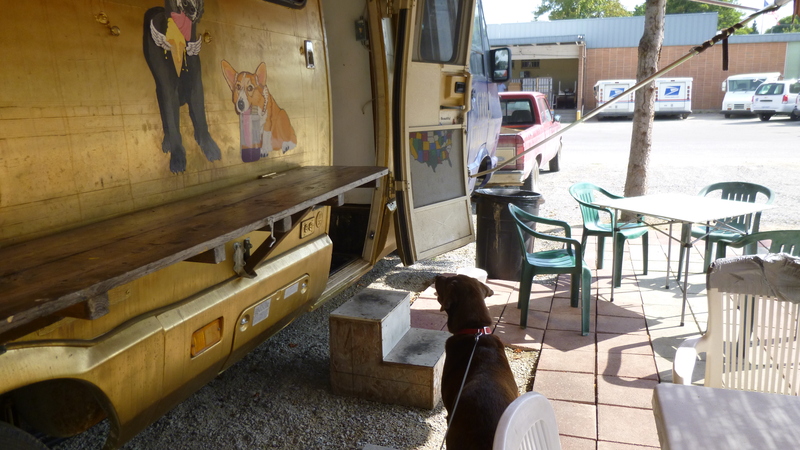 I tried the beef brisket instead, and the guy even came out of the trailer to give Tula some meat, and she then wanted to follow him back into the trailer! So much for my loyal dog – she can be had for any goodie!! I took her for another walk along the river, and then finished off my walking for the day with another walk around the pretty beach area that I had walked along last night. 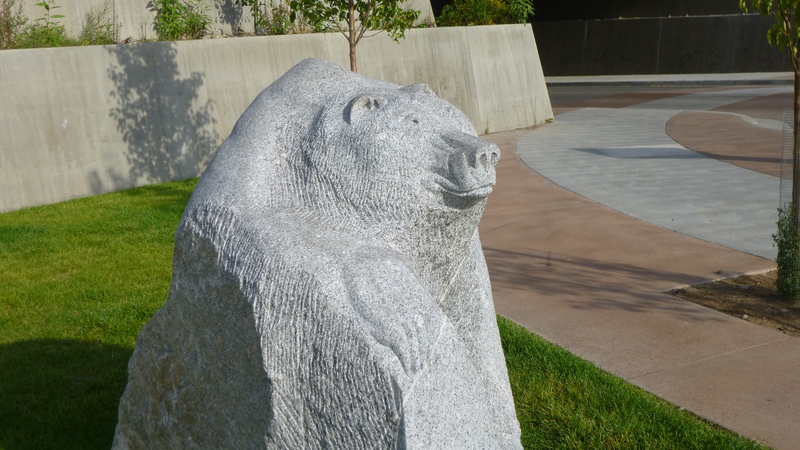 Then I was ready to head south through part of Idaho’s panhandle to Coeur d’Alene. I was aware of the wildfires in Idaho, (and lots of other places in the west) and so far I wasn’t too close to any of them. But I figured I better keep track of them. 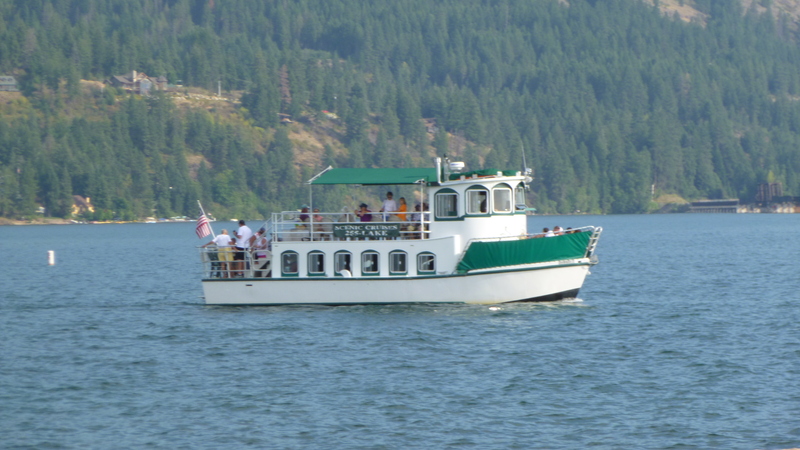 Coeur d’Alene is a popular lakeside resort city, and I called ahead to get a campsite nearby. 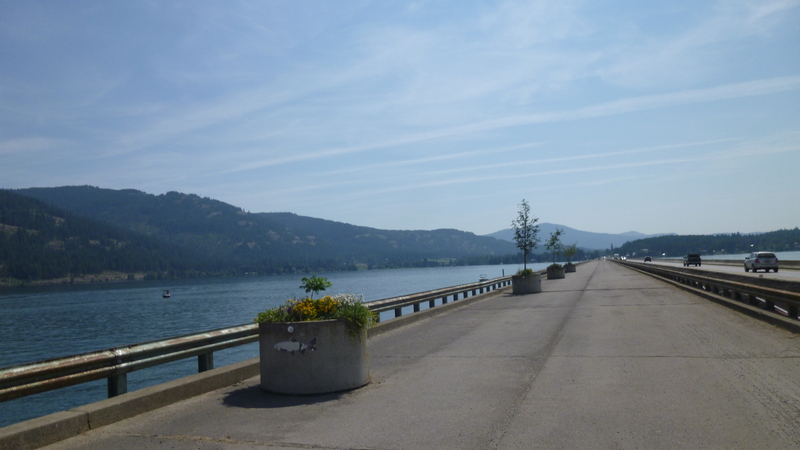 The first place I called was full, but the next one had a site for me, and the campground was right across from Coeur d’Alene Lake. 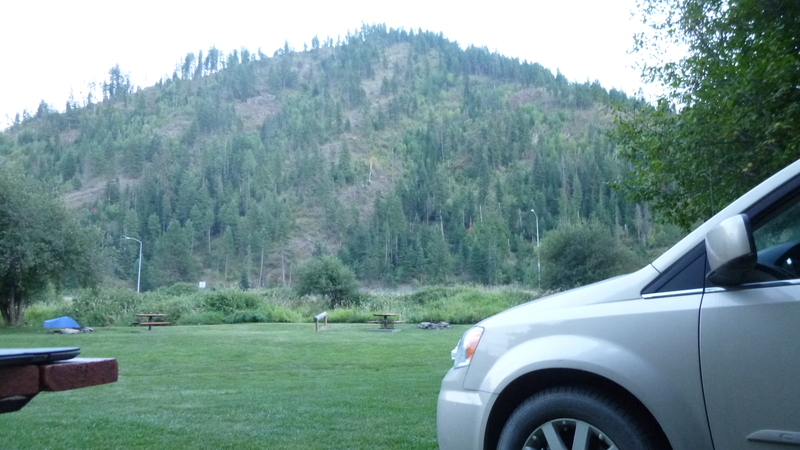 So we drove for a while, and found the campground, and got set up for the night. Once again it seemed to get dark early, but I got my comfy lawn chair out, turned on the lantern, put on a sweatshirt, and actually did a little knitting since I couldn’t work on the computer. It was a real peaceful night.